14+ only. 114s to 15s must be accompanied by an adult. No refunds will be given for incorrectly booked tickets. During the winter of 1984-85, Franz Treichler and Cesare Pizzi redefined the grammar of rock using rudimentary machines. They were inhabited by an uncompromising, raw and poetic vision. Joined by drummer Frank Bagnoud, they fine-tuned the formula of the Young Gods. Their first concerts were like electroshocks. They featured voice, drums and sampler... and walls of guitar sounds, but without guitars: their music was unheard of. When the first eponymous album appeared in 1987, the British press heralded the phenomenon: "The Young Gods are the New Thing, they are what happens next ..." In the early 1990s, with Al Comet replacing Cesare Pizzi on samplers, the trio surfed the wave of alternative rock. The album “T.V. Sky”, with its single "Skinflowers" rotating on MTV, opened the doors of the United States. David Bowie, U2 and Nine Inch Nails began citing them as inspirations. Things accelerated at a frantic pace. So much so that it all became too much. In the early 2000s, the trio regrouped in Geneva, redefined its priorities, and moved closer to the effervescent electro / techno scene. Bernard Trontin replaced U?se Hiestand on drums. The Young Gods celebrated their 20th anniversary in 2005 at the Montreux Jazz Festival, with the Sinfonietta orchestra of Lausanne and the singer Mike Patton (Faith No More, Mr Bungle, Fanto?mas). They also spearheaded a myriad of multidisciplinary creations, for Swiss Expo.02, for the Geneva Science Museum, with anthropologist Jeremy Narby for “Amazonia Ambient Project”, or reinterpreting the legendary Woodstock concert of 1969... They also collaborated with alternative hip-hop group Da?lek, with the trio of improvisers Koch, Schu?tz & Studer, and with the band Nac?a?o Zumbi for a Brazilian tour and another Montreux performance. After releasing an acoustic album (“Knock on Wood”, 2008), which they took on tour, the trio turned their machines back on and recorded the fiery “Everybody Knows” (2010), with the support of a fourth member, flesh-and-blood guitarist Vincent Ha?nni. 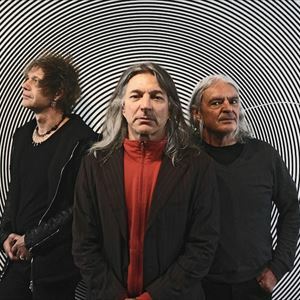 Then they performed their first two albums on stage, “The Young Gods” and “L'Eau rouge”, with Cesare Pizzi returning to his original place on samplers.